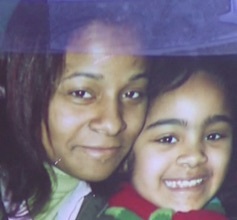 A school bus driver killed a woman in a crosswalk in University Heights last week. NYPD filed no charges. Carmen Puello, 43, was crossing Sedgwick Avenue at West Fordham Road at around 12:30 last Friday afternoon when the driver, eastbound in the center lane of West Fordham, struck her while turning right onto Sedgwick, NYPD told WCBS. Puello was pronounced dead at Saint Barnabas Hospital. 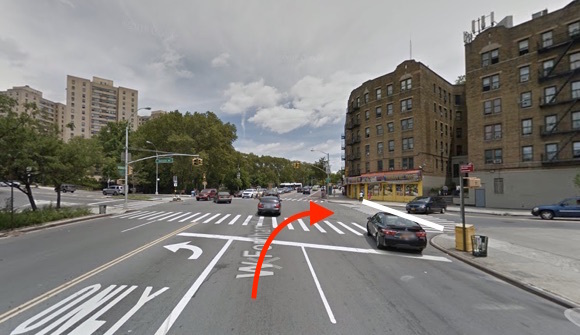 Sedgwick Avenue at West Fordham Road is a wide intersection with concrete medians in the crosswalks. Between 2009 and 2015, 107 people were injured in crashes at the intersection, according to city crash data. A majority — 74 — were motor vehicle occupants, a sign of collisions occurring at high speeds. Motorists injured 33 people walking and biking at Sedgwick and West Fordham between 2009 and 2015, and injured four pedestrians there this year as of August. Adhering to protocol when police don’t file charges, NYPD did not release the bus driver’s name to the press, identifying him or her only as being 47 years old. We called NYPD this afternoon for an update, and to ask who had the right of way, but the department’s public information office had no knowledge of the crash. The crash that killed Carmen Puello occurred in the 52nd Precinct, and in the City Council district represented by Fernando Cabrera. You should check this; the graphic isn’t consistent with the written description. The text says the vehicle was traveling eastbound, but the graphic shows a westbound movement. Isn’t this the sort of thing you’d appoint a special prosecutor for, to investigate corruption and dereliction of duty within the NYPD and its supporting legal apparatus (especially prosecutors)? Obviously the normal NYC justice and political system isn’t capable of handling the problem (unsurprisingly, really, as they’re all … close). So who’d do this? State? Feds? The copy was correct (per source), the map was wrong. Two More Killed on Hylan Boulevard — Who Will Act to Stop the Carnage?